GRAND RAPIDS – Lina Puerta was originally only going to submit one of her sculptures for ArtPrize Eight. But by request of curator Michele Bosak, the Brooklyn artist expanded her entry, adding another seven pieces that were all meant to examine the relationship between nature and the body. 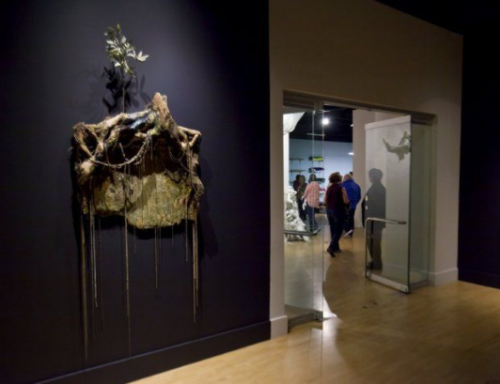 On Friday, Oct. 7, Puerta's work – "Traces" – received the $5,000 Sustainable Art Award, given to one of the 11 artists located inside The Fed Galleries at Kendall College of Art and Design of Ferris State University. The sustainability award was created for ArtPrize Eight with the intention of honoring one artist at the KCAD. It was funded by Cascade Engineering, and judged by Alice Gray Stites, who served as a judge at ArtPrize in 2013. "I was so drawn to the work she did that, even though the one piece was really lovely by itself, I thought having the grouping would make more of an impact," said Bosak, the curator of The Fed Galleries' RE• exhibition. After reviewing the 10-piece exhibition, Gray Stites said Puerta's installation stood out as an "exceptionally well-conceived and crafted exploration of the notion of sustainability." "Transforming both nature and artifice, each of Lina Puerta's Traces offers a poetic and fantastical vision of the potential artifacts of our anthropocene." Traces uses concrete, clay, resin, wood, foam, fabric, craft, recycled items and artificial plants to "blend the human-man world with the natural, exploring notions of control, consumerism and life's fragility." The goal behind every piece in the RE• exhibition is to engage visitors in a conversation about living more sustainable lives. Many of the artists used reclaimed materials donated by partner Goodwill Industries of Greater Grand Rapids. Cascade Engineering sponsored a similar environmental sustainability award in 2009, which was given to Singapore-based artist Scott Hessels. Puerta's work was the only KCAD piece to receive an award this year. The Fed Galleries was a finalist for Outstanding Venue, while artist Matthew Steinke was a time-based finalist for the jurors' shortlist with his piece, "The Magnetosphere." The RE• collection will be viewable at KCAD through Saturday, Oct. 15.